Genetic manipulation, industrial methods of agricultural production and disregard for natural laws have all led in recent times to growing public concern about the safety of food. As a result, there is a corresponding growth of interest in organic methods of farming. 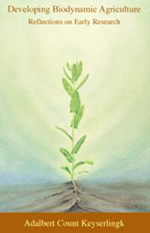 Biodynamic agriculture, founded by Rudolf Steiner in the 1920s, is a further development of the organic approach, using special preparations - which work in harmony with cosmic and earthly forces - to enrich the soil and enliven food. Biodynamic agriculture was launched at a conference held on the Koberwitz estate in Germany. Adalbert Count Keyserlingk, the son of the hosts, was present, and this book reflects his life-long absorption in biodynamics. It presents a wide range of material, including the Count's personal experiences of Rudolf Steiner at work, his reflections on practical research and experimentation (including photographic documentation) and descriptions of biodynamic preparations. More than anything else, however, his words successfully convey the enthusiasm, the exalted feelings and the power of initiative that arose from Rudolf Steiner's work in this field: to found a method of farming which can provide nutritious and safe food for the future of humanity.